When you see a class hosted by the Tulalip SNAP-Ed Program it’s safe to say you can expect a little fun and often times, some good eats. The program offers education about nutrition and the importance of exercise, encouraging community members to live healthier lifestyles. SNAP-Ed is known for their Tulalip Walking Club that meets each week to walk about the reservation and their Wellness Wednesdays classes, formerly held at the Tulalip Administration Building. Maybe it’s the food, maybe it’s the activities or perhaps it’s the prizes, but whatever it is, the participants of a SNAP-Ed training have a good time, showcased by their many smiles and laughter. Which is why it’s no surprise that SNAP-Ed’s most recent endeavor is extremely popular. If you haven’t heard of the Eat Smart, Be Active, Nutrition and Cooking course, you’re going to want to get in line for the next series of classes so you can experience the nine-week health journey in its entirety. 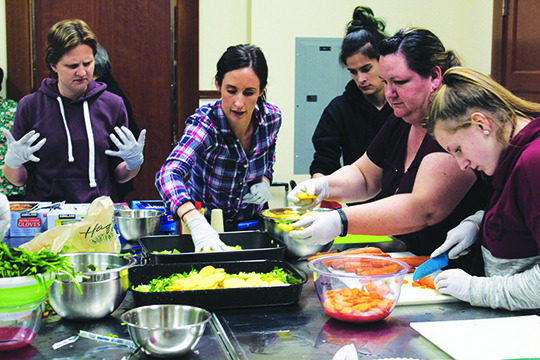 Classes are currently held every Wednesday, until March 21, from 5:00 p.m. to approximately 6:30 p.m. at the Tulalip Dining Hall where the students are gaining much of knowledge about buying, preparing and consuming healthy meals. Tribal communities nationwide face health issues such as diabetes and hypertension due largely in part to assimilation and a disconnect from traditional foods. Whether its lack of time or kitchen knowledge, many Americans end up hitting the drive-thru or placing an Uber Eats order at the end of the day. The Eat Smart, Be Active course not only teaches participants how to cook, it also teaches how to meal plan, put together a budget-friendly grocery list, the nutritional value of foods and how to incorporate more veggies into your diet. The classes also include exercise breaks throughout the daily lesson plan, which the students enthusiastically participate in. “There are four really important exercises that you need to know,” explains SNAP-Ed Nutritionist, AnneCherise Jensen. “You need to know muscle strengthening exercises, cardio, stretching or yoga and also bone strengthening exercises. Today we did a cardio pyramid which is a series of exercises to get our heart rate up, get fresh oxygen to the brain and wake us up a little bit. After their daily nutritional lesson, the students enter the kitchen where they work together to prepare a meal. SNAP-Ed incorporates fresh ingredients with hand-picked produce and also raffles off reusable grocery bags filled with ingredients that the students can use to make recipes at home. Fun might be the best way to describe the Eat Smart, Be Active course as Tyler’s views were shared by a group of co-workers from the Tulalip Resort Casino as well as numerous community members. For more information, including how to sign-up for the next course, please contact SNAP-Ed at (360) 716-5632. This entry was posted in Health, News, Tulalip News and tagged SNAP-Ed, Tulalip by Kim Kalliber. Bookmark the permalink.